I heard an interesting "Commentary" on a news channel Monday Night. The reporter was mentioning that the first Monday after New Year's is known as "Blue Monday". Apparently, studies have shown that because the holiday season is all over; because school and work places are generally back to a normal schedule; because most geographic areas are dreading the impending long, cold stormy winter season; because people have made resolutions they are already having difficulty keeping; because visitors have headed home leaving a void in the house; because houses have lost their holiday finery and look empty by comparison; because holiday bills start showing up in the mailboxes and financial reality sets in, the phenomenon of "Blue Monday" has been noted. I decided to ward off this scenario, personally, by planning a tablescape. The design process always makes me happy, and is sure to dispel any blues. 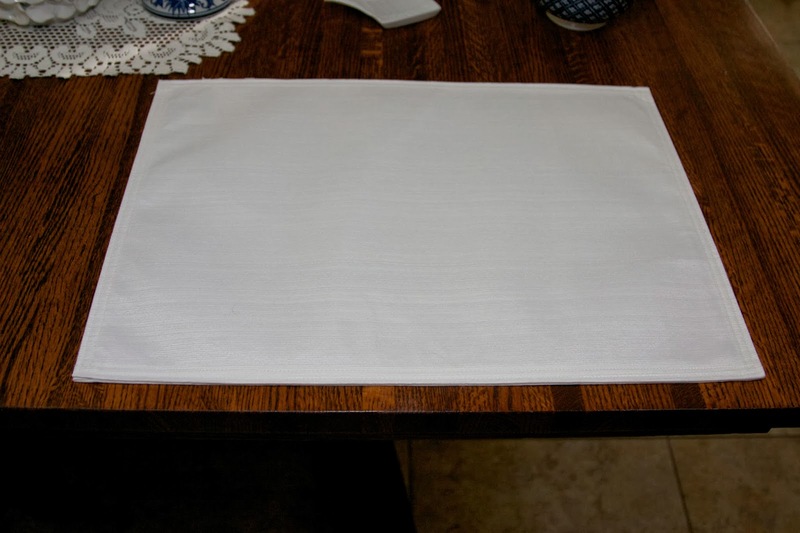 I started with a white placemat from Macy's. 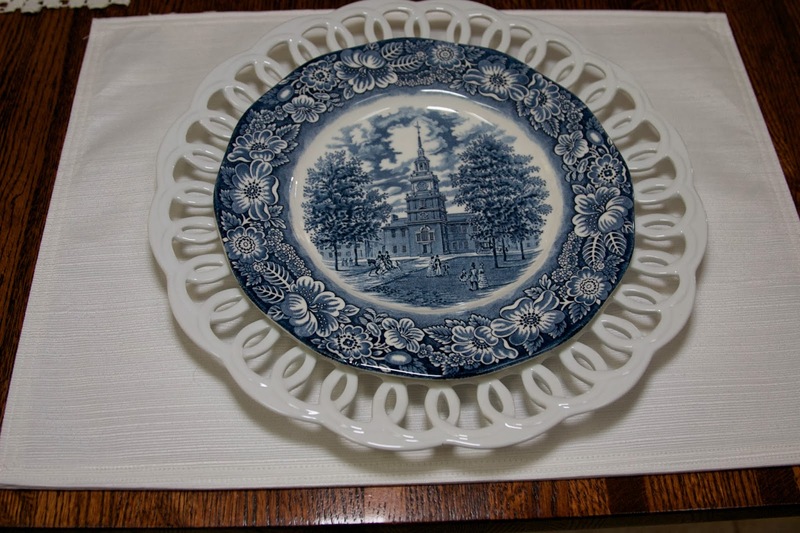 Next comes the salad plates that depict "Monticello". 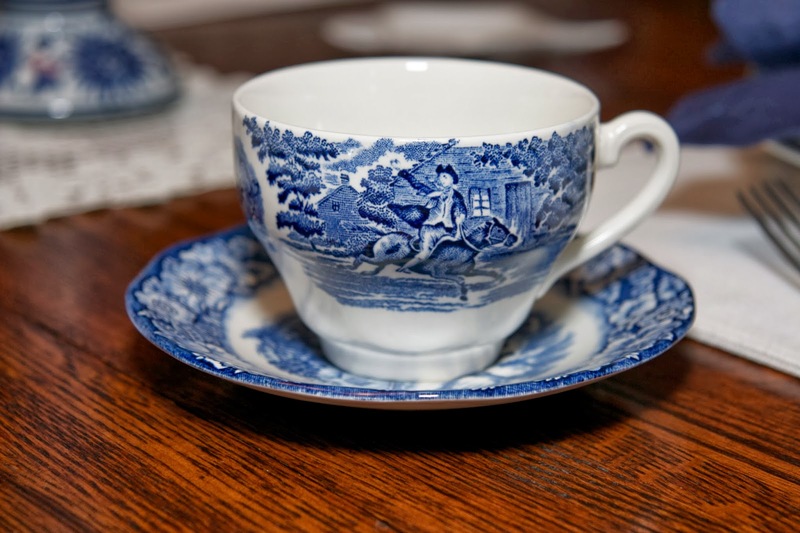 The stack is topped by a small bowl depicting "Betsy Ross". I really like the craftsmanship of these plates. The engraving is well done, the blue color is so pretty (it actually doesn't photograph as pretty as it really is) and the beautiful floral border is just lovely. They really do honor well the history of our nation. 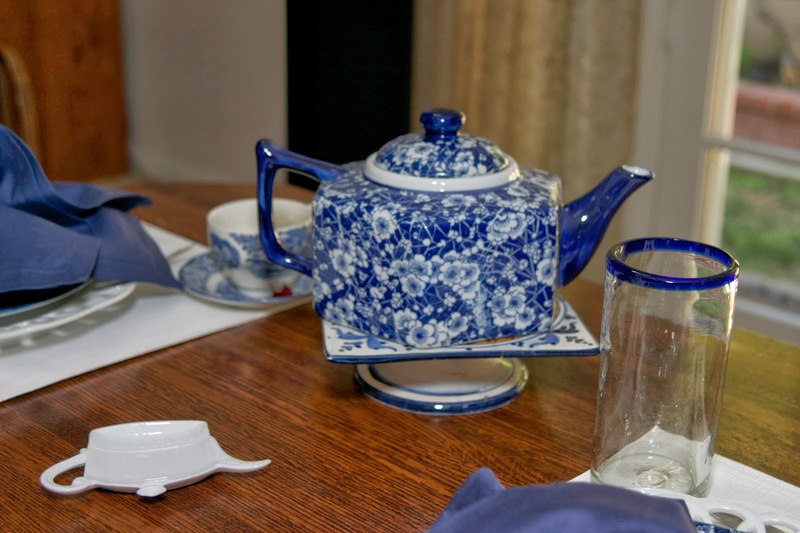 I'll be planning tea for this meal, so I added the cup and saucer to each place setting. They depict "The Old North Church". 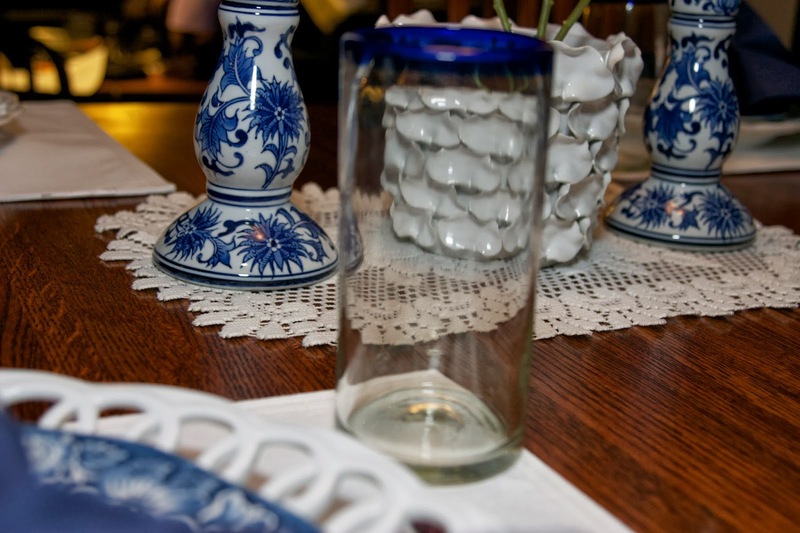 I also added a water glass that is Mexican glass and was found at Pier One. 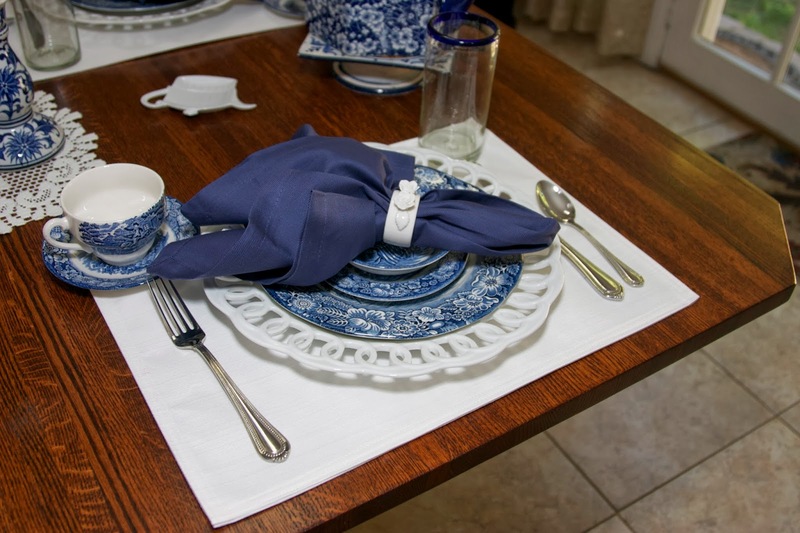 The table setting is complete with navy blue napkins from World Market and porcelain napkin rings that I found while out antiquing. I used my Mikasa flatware. My centerpiece is made up of a lace doily topped with candle holders from Hobby Lobby and a wonderful flower pot that was a Christmas gift from a dear friend. She found it in Montana and it is one of the most unique pieces of pottery I think I have ever seen. 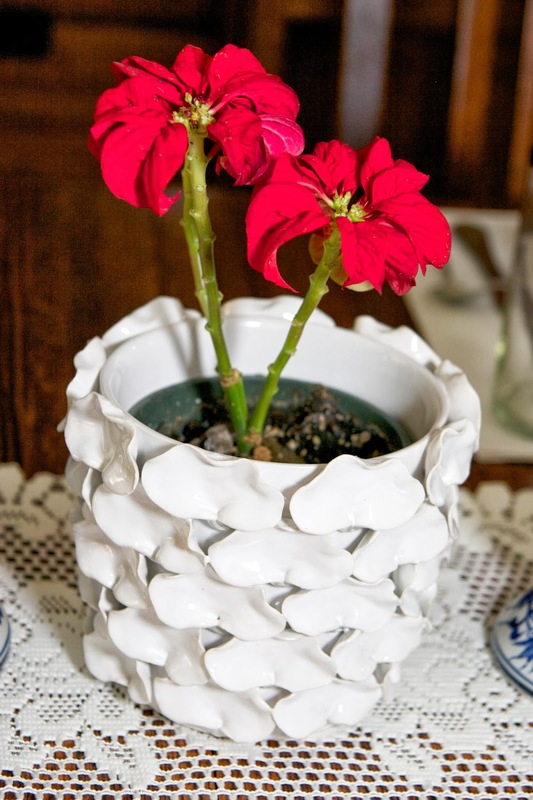 She also included the A "Winter Rose" Poinsettia as part of the gift. Since I'm planning tea, I'm using a favorite teapot of mine that was a birthday gift. Its pedestal was bought on our trip to Florence, Italy. phenomenon exists? I hope that everyone's first week after all the holidays is a good one, and filled with anticipation of all the things that a new year promises. I'll be linking up to www.betweennapsontheporch.net. 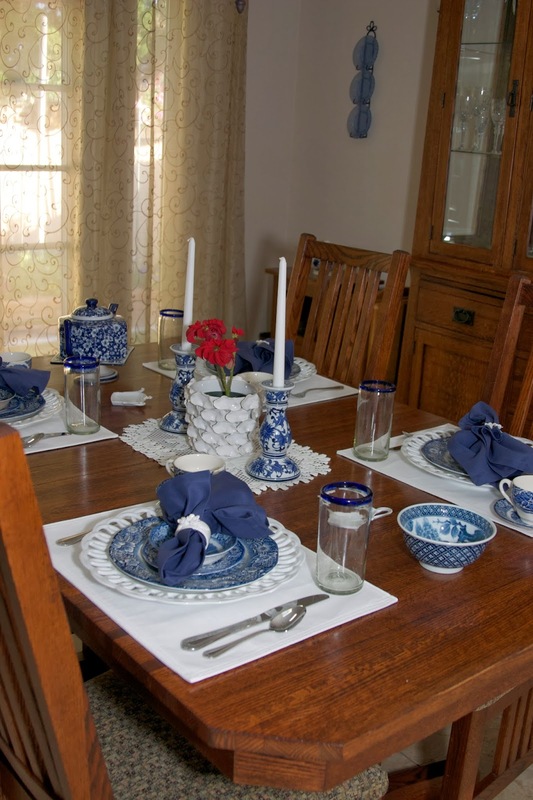 Thank you, Susan, for hosting Tablescape Thursday! I love reading your comments, and will respond to them, but until I learn how to fix it, you have to come back to my site to read the response! If you'd like to become a follower, just go to the top of my blog and fill in your email address by "Follow by Email", then hit "Submit". I love blue & white! 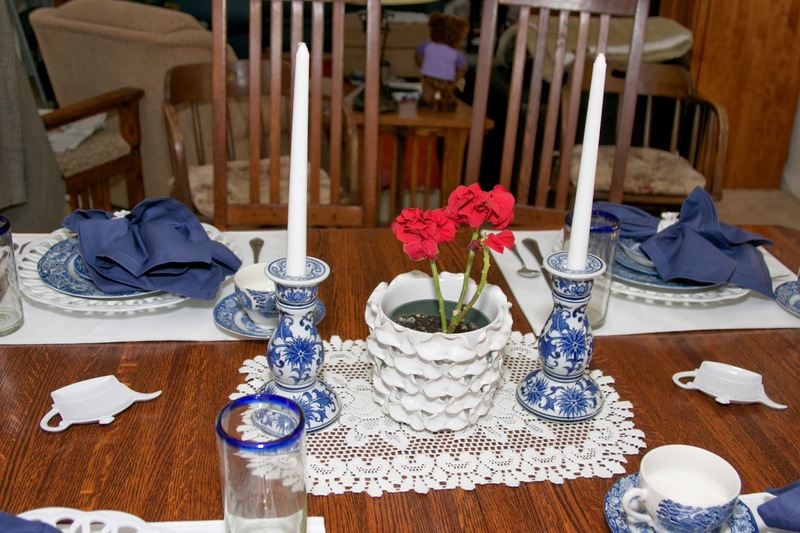 You set a beautiful table for Blue Monday! Love the china and that it tells a story. I'm never blue after the holidays! I love getting back into routine.......and tablescaping! Gorgeous table...crisp white and blue always makes me smile. 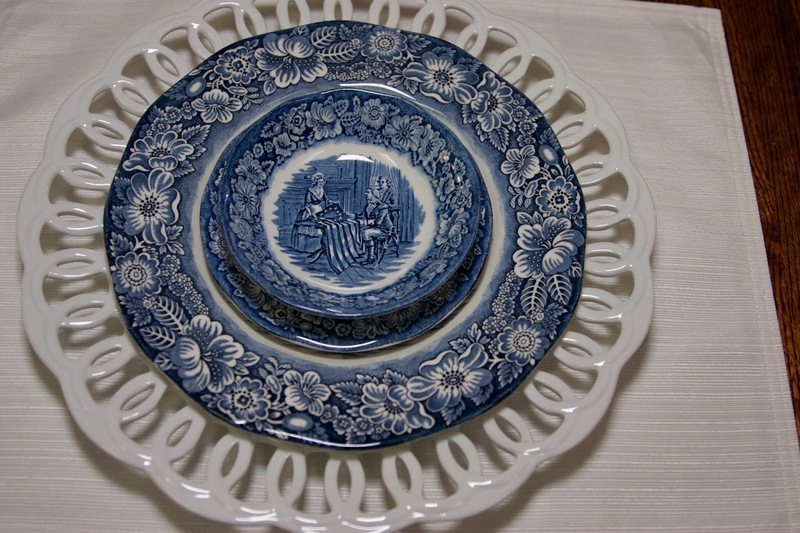 I have many, many pieces of the Liberty Blue...love the pattern and those reticulated chargers are so pretty. Have a wonderful week, Rosie. This table looks so fresh and beautiful! No one would be 'blue' dining here! Happy 2014! The china is beautiful and so are the glasses. I'm still kind of basking in holiday afterglow and my college aged son isn't going back to school til Sunday, so no blues here! Thank you for your positive comments. I thought that flower pot was very unique as well. You'll probably see it in more tablescapes!! Have a great 2014! 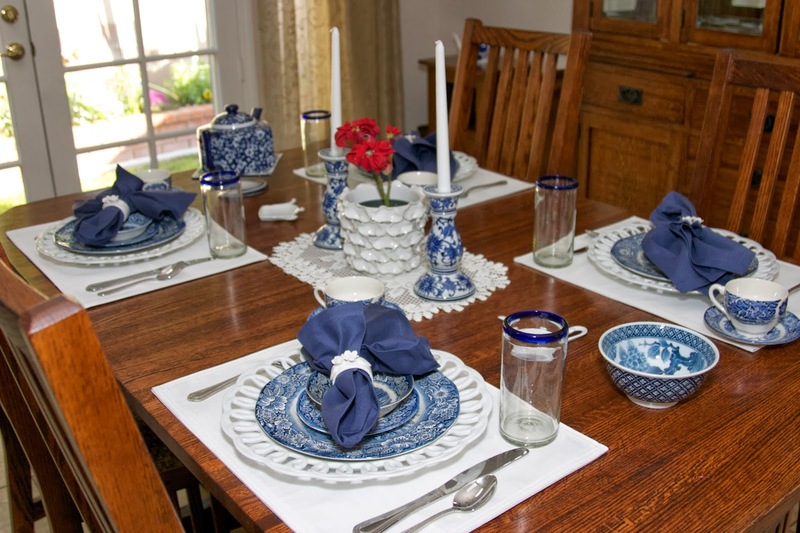 A very pretty blue table but then I love blue and white dishes and yours are so pretty. I've never heard the term "Blue Monday" before! 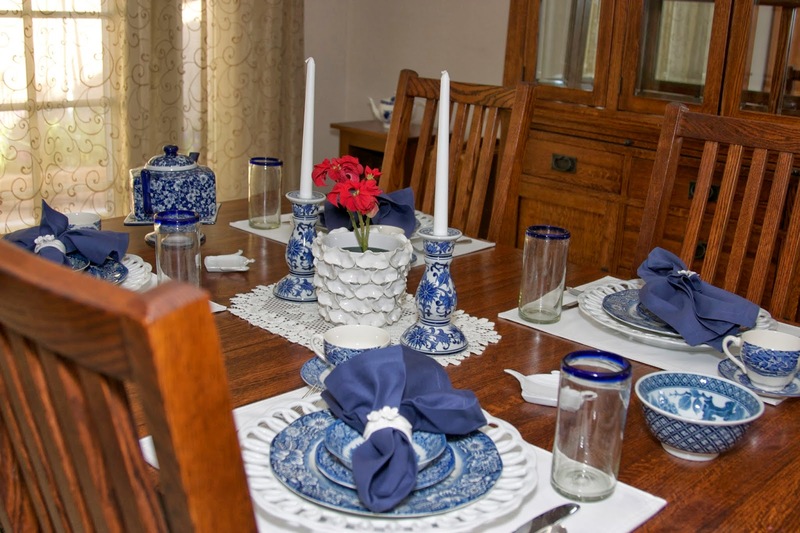 What a pretty tablescape you created, the blue and white theme for January is perfect! I love blue and white for any time of the year, but this combo of colors seems perfect for cold dreary winter days. 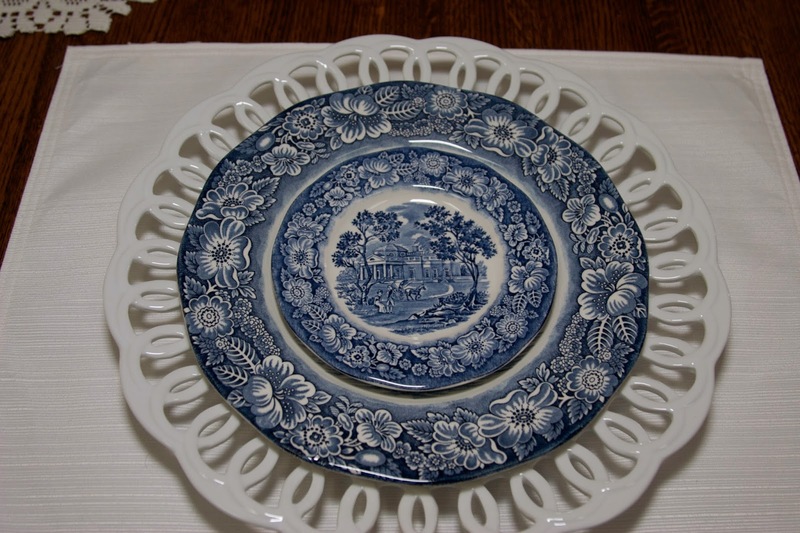 Your china is a particularly beautiful pattern, I love the flowered borders on the plates. 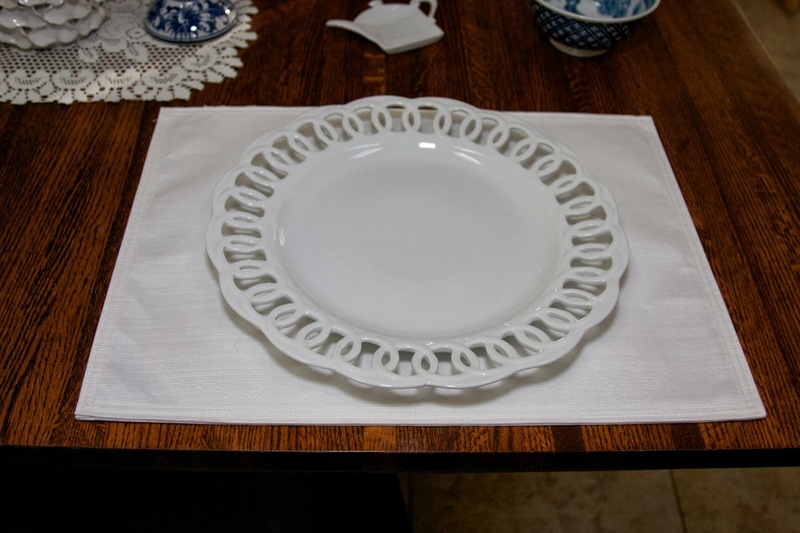 I have four place setting of the coaching series that I want to use for a tablescape this month (I just washed them up last night). Well, Rosie - you have brought a new spin to Blue Monday. Thank you for the "Happy" one! 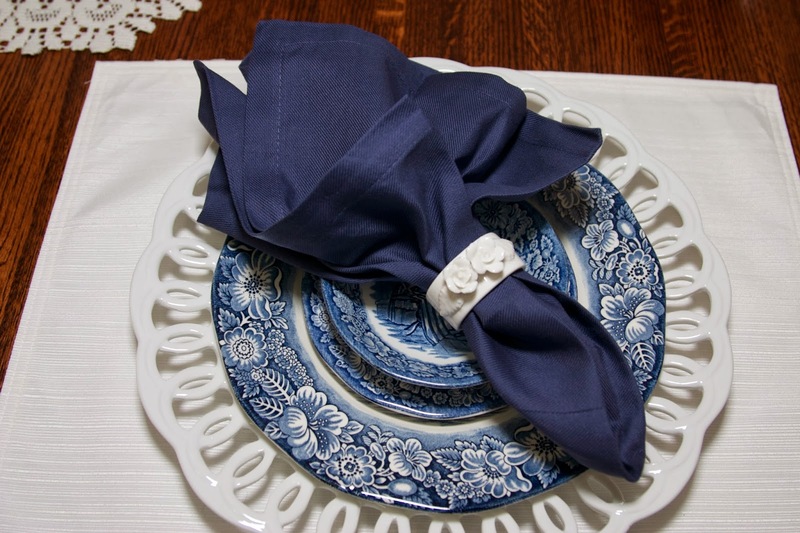 Since almost everyone loves blue and white, this will long be a favorite of tons of bloggers. Don't you love those chargers? All of the ones that I own were purchased as seconds and I have never been able to find one thing wrong with any of them. Your centerpiece is so pretty, too. Love those candle sticks! !